Two Polish nationals were so disappointed with the quality of herbal cannabis sold in Carrickfergus that they decided to grow their own, a court heard on Friday. Appearing in the dock of Belfast Crown Court were 31-year-old Marcin Jarzebiak and Bartosz Czeslaw Szadkowski, 38, who each admitted a charge of cultivating cannabis. Szadkowski also pleaded guilty to possessing the class B drug. A Crown prosecutor told the court that police stopped a Ford Focus driven by Szadkowski and with Jarzebiak on board on October 22, 2013. When they were speaking to the driver, police noticed a strong smell of cannabis. They searched the vehicle under the Misuse of Drugs Act and found a small bag containing 32 grams of herbal cannabis down the driver’s side of the vehicle. 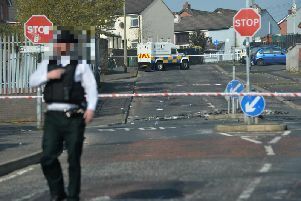 The pair were taken to the police station and a decision was made to search their home on Carrick’s Albert Road. The prosecutor said “as a result of this search, police discovered a cannabis growing operation comprising of 37 plants together with the associated paraphernalia”. Seven of the plants were attributed to Jarzebiak, while the remaining 30 plants belonged to Szadkowski. During police interviews, both men admitted they were “long-term regular users of cannabis”. They also made the case that the quality of herbal cannabis sold in Carrickfergus was so poor that they decided to “embark on a home-growing operation”. The prosecutor told Judge Gordon Kerr QC that the Polish nationals came before the court with no previous criminal convictions. Defence barrister Michael Tierney, representing Jarzebiak, said his client came to Northern Ireland seven years ago and in that time had maintained a good working record. Mark Farrell, representing Szadkowski, said his client came to Northern Ireland via Holland and that he “believed quite wrongly that Northern Ireland was just as liberal” when it came to drugs. Szadkowski, Mr Farrell said, had been here since 2006, had a good work record and used cannabis to help alleviate the pain he experienced due to arthritis. Sentencing the pair, Judge Gordon Kerr QC said the cannabis found in their home was “not indicative of a commercial enterprise” but was for their personal use. Szadkowski was handed a 12-month sentence which was suspended for two years, while Jarzebiak was given a nine-month sentence, which was also suspended for two years.